Wildfires can be difficult to control. What is controllable is how you prepare your home or business for wildfire before it threatens. Ultimately, the difference between survival and destruction are the steps you take to reduce the opportunity for the initial ignition of your home or business. There is an explicit link between the selected vegetation, its placement and management in the area surrounding a building, often referred to as “defensible space,” and construction materials and building design. Survivability of a building will depend on creating and maintaining an effective defensible space on the property and on careful selection of building materials and construction design features. Wildfire is a serious risk in 38 states around the country, threatening about 120 million people and their property. The number of destructive, expensive wildfires continues to rise, and whether or not a particular property or a cluster of structures survives a wildfire may depend largely on what people do now to prepare. The ignition of a building during a wildfire can occur in one of three ways. These include exposure to wind-blown embers (also known as “firebrands”), direct contact by flames, or a radiant heat exposure (radiant heat is the heat felt standing near a burning object, such as a campfire; but during a wildfire, the heat source could include burning items such as a woodpile, toolshed and/or a large shrub). Of these, exposure to wind-blown embers is considered the most important. Wind-blown embers generated by the burning wildland vegetation, or other burning buildings or structures, can land on or near your home or business and ignite it either directly or indirectly. Examples of a direct ember ignition include ember entry through a vent or open window with subsequent ignition of combustible materials or furnishings inside the building. Direct ignition by embers also can occur through sufficient ember accumulation on combustible materials such as a wood shake roof, on combustible decking, or immediately adjacent to combustible materials such as siding. Examples of an indirect exposure include ember accumulation and ignition of vegetation or other combustible materials (e.g., a woodpile or shed) located near your home or business, with subsequent ignition of a building component by a radiant and/or direct flame contact exposure. With inadequate defensible space, the wildfire could burn directly to your home or business and ignite an exterior component, or break the glass in a window and ultimately burn into the interior of the building. Developing and maintaining an effective defensible space will minimize the chance of this happening. Once homes and other structures ignite and burn, they will become a source of embers and threaten other homes and buildings. 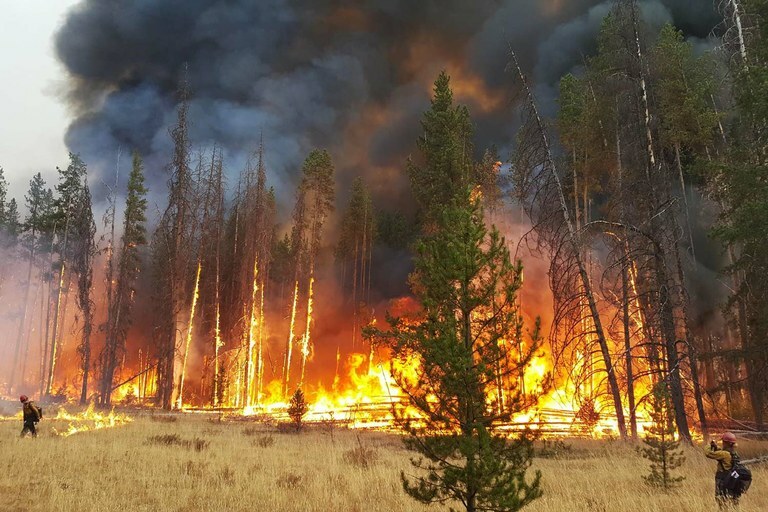 Depending on building- to-building spacing and topographical features, one wildland fire-to-building ignition can result in additional ignitions by building-to-building fire spread. Building-to-building ignitions can result from embers, direct flame contact and/ or radiant heat exposures. The potential damage from radiant heat will depend on the level and duration of the exposure. The radiant heat exposure from a burning building will be longer than that from a burning shrub. Installing an exterior water spray system, as part of your “before the fire” activities, and then activating when a wildfire threatens, typically just prior to evacuating. Application of a gel coating to the exterior of your home or business to protect it from wildfire, applied prior to evacuation. This type of coating could also be applied by fire-fighting professionals if they are present. 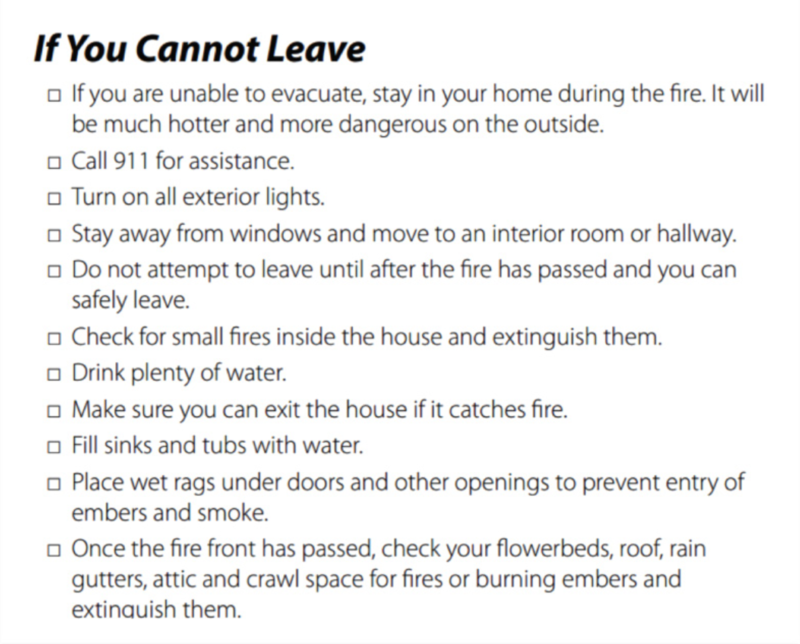 Post-fire studies conducted in Australia have shown that the chance of home survival increases if the resident “stays and defends.” Evidence in Australia and the U.S. have also shown that delaying evacuation will increase the chance of harm coming to the individual(s). For this reason, we urge residents to evacuate when requested by police or fire authorities. There are situations where residents could become trapped and therefore not able to safely evacuate, so preparation for that possibility would be prudent. More recently, evidence from post-fire studies in the U.S. has demonstrated that defensive actions taken on the part of fire-fighting professionals will also improve the chance of home survival. The latter finding is not surprising, but to reiterate what has already been stated, firefighter intervention at your home during a wildfire should not be expected. An exterior water spray system can be roof- or ground-mounted. The objective of the sprinklers is to limit the spread of the fire to the home or business and/or extinguish wind-blown embers before they reach the building being protected. Using exterior sprinklers can help to reduce the chances of a home or business being damaged by a wildfire, but like all other actions that can be taken, it requires planning and the system must be maintained. It should also be treated as one component of a fire safe plan and it should not eliminate actions taken regarding other recommendations in this guide. It is important to understand that the effectiveness of an external sprinkler system has not been completely evaluated, although studies that have been conducted in Canada have shown that ground-mounted sprinklers can help protect a building in cases where preparation and maintenance of defensible space has been lacking. These studies have stressed that the distribution lines of the sprinkler system must be protected from radiant heat and flames. Regarding the ability of the spray system to extinguish embers before reaching the home or business, it is likely that they may disrupt the flow of the water spray and therefore may not extinguish all of the wind-blown embers before they arrive. Gels are composed of polymers that can adsorb large amounts of water. The heat from a fire will first evaporate the water contained in the gel before it can start to heat up the substrate on which the gel is applied. Several gel products are currently commercially available and can be purchased by the homeowner. When wildfire threatens, the product would be applied to vertical and horizontal surfaces on the home or business. These surfaces include siding, windows, under-eave areas and potentially under-deck areas. Gel products would start drying out (evaporating water) soon after being applied, and would become less effective with time. Gel manufacturers provide time limits whereby their product would remain effective. These times are typically reported to be hours. If you see a wildfire and have not received notification already, call 9-1-1. Do not assume someone else has already called it in. If you have time, start preparing your house for the worst. Remove any and all flammable materials as far away from exterior walls as possible. Close all attics, vents, windows, pet doors, shutters, etc. Close all fireplace screens but make sure the vents are open. Make sure that all natural gas, propane, gasoline, and fuel oil sources are securely shut off at the source. Make sure that you leave any and all sprinklers on. Keep a steady stream of water going on the highest spot of your house for as long as you can. Be sure to leave all lights on so that you can see through the smoke. If the fire starts getting close to your house, put your car near an entrance way so that you can quickly escape if you have to. Start the vehicle and leave it running but do not do this if you have the vehicle in an enclosed area. Drive cautiously out and do not speed. You do not want to have an accident while trying to leave. Except for the driver, have all passengers to lie as close to the vehicles floorboard as possible and cover them with a fire retardant material. If you receive an evacuation order – leave do not hesitate. If you are trapped in your home stay away from the outside walls. If you are trapped in an outside area, be sure that you find a sparse fire fuel area (rocky not vegetation). If you are on foot lie face down in a ditch on the uphill side. Recently it has been said that Wildfires are the norm. If that is indeed the case, we urge you take precautions in protecting your property and have a plan of escape as well as a Go-Kit for each member of the family. You can learn more regarding Go-Kit’s on the MYREDFOLDER® website.